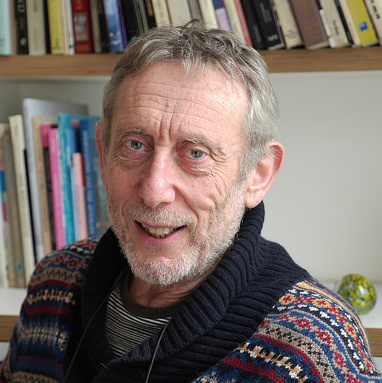 Michael Rosen is one of the best-known figures in the children’s book world. A former Children’s Laureate, he is renowned for his work as a poet, performer, broadcaster and scriptwriter and has been involved with over 140 books including ‘The Sad Book’ with Quentin Blake, ‘We’re Going on a Bear Hunt’ with Helen – made into an animated film for Channel 4 broadcast Christmas Day 2016 – and ‘A Great Big Cuddle’ with Chris Riddell. He lectures and teaches in universities on children’s literature, reading and writing. Michael is a familiar voice to BBC listeners and is currently presenting ‘Word of Mouth’, the magazine programme that looks at the English language and the way we use it. He visits schools with his one-man show to enthuse children with his passion for books and poetry, and his weekly ‘letter to the Secretary of State for Education’ in the Guardian critiques government education policy from the point of view of a parent. Michael’s YouTube channel – ‘Kids’ Poems and Stories with Michael Rosen’ has been viewed over 45 million times around the world. Acclaimed children’s novelist, poet, broadcaster, columnist and former Children’s Laureate Michael Rosen delivers the opening keynote championing creativity and imagination in the face of what he calls “data-driven education”.